Small stature, big savings, beautiful light! H&H’s 6700K Mini-Twistee® Compact Fluorescents are part of our Vi-Tek 93® Plus line. They provide the closest replication of natural outdoor light available, mimicking the color and quality of outdoor light on a nice day at 93% or better (hence their name!). These bulbs make for a bright, cheery atmosphere in your home or business, and they’re perfect for applications when color matching is key. In addition, H&H’s Mini-Twistees® start saving you money the minute you screw them into the socket. And they keep on saving money—and precious energy—throughout their long-burning life! Just replace your wattage-hungry incandescent bulbs with new Mini-Twistee CFLs, and you’ll slash your lighting power costs by 75%—while maintaining, or even increasing, your present light levels. What’s more, you’ll use only one Mini-Twistee® for every 10-13 incandescents, saving greatly on overall cost, labor, and maintenance. See Description tab below for further details. Mini-Twistee® is available in a variety of watts, and in two different Color Temperatures. But however you use them, Mini-Twistee CFLs are backed by our one-year, no-nonsense, Free-Replacement Warranty. The bright, natural light of our Vi-Tek 93® Plus bulbs gives you greater seeability, and is just like the light you see when sitting outside on a nice day. H&H's Mini-Twistee® Compact Fluorescents start saving you money the minute you screw them into the socket. And they keep on saving money—and precious energy—throughout their long-burning life! 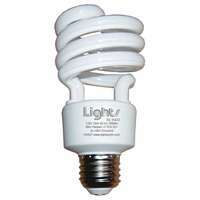 Mini-Twistees are commercial grade which means you are getting a superior light made with quality components. Just replace your wattage-hungry incandescent bulbs with a new Mini-Twistee CFLs, and you'll slash your lighting power costs by 75%—while maintaining, or even increasing, your present light levels! At 10¢ per kWh, just one 20-watt Mini-Twistee® replacing one 75-watt incandescent will save $55 in energy costs over its 10,000-hour life. Savings are based on burning the 20-watt Twistee at 10¢ per kWh (20 watts X 10kWh X 10¢) versus the cost of operating a 75-watt incandescent for the same length of time. What's more, you'll use only one Mini-Twistee® for every 10-13 incandescents, saving greatly on labor and maintenance, and reducing the number of bulb-changing operations. Their small, compact size makes them a perfect fit in most A-19 applications. Mini-Twistee® is available in various watts and in two different Color Temperatures, however you use them, Mini-Twistee CFLs are backed by our one-year, no-nonsense, Free-Replacement Warranty.